In order to create a successful beauty blog, besides having killer content and products that will rival even the best-dressed celebrities on the red carpet, you need a visually appealing website. This will garner you more traffic, solidify your reputation as a fashion guru, and even boost your annual sales. A solid beauty blog WordPress theme will have easily manageable elements and include features such as background videos, stunning sliders or galleries, and will support your building an eCommerce shop right on top of it. In addition, it will have beautiful colors to choose from, extensive font options, and of course, a way to integrate social media into it all so your readers can not only follow you but share their favorite beauty trends as well. In addition, all WordPress websites should have a responsive design, SEO optimization, localization, and clean code protecting your website from outside threats. When it comes to WordPress beauty blog themes, there are boundless options on the market today. However, finding the perfect one can be difficult given the options that are available. If you are looking for a beauty blog theme, and want to start trends, not follow them, check out the themes we have gathered for your up-and-coming beauty, fashion, or lifestyle website. If you think we missed a theme, please let us know in the comments below. If you are looking for a clean and sleek way to share your best beauty tips, Mokka has just what you need. For instance, this flexible theme includes a white color scheme that allows you to choose a pop of color to accent your best products, reviews, and content. More so, you can create unlimited pages using the exclusive Page Composer and entice your readers with versatile grid and slideshow sections that display crystal clear images of what’s happening in the fashion world right this minute. 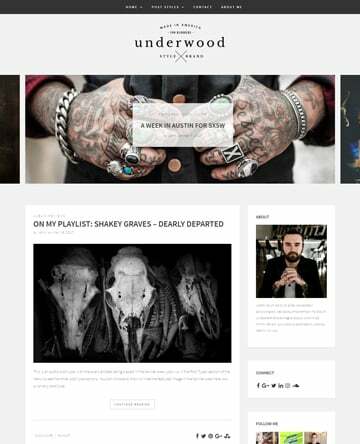 In addition, with Mokka you can choose from 5 unique blog layouts to give your website that standout feel, customize your drop down menus with posts or links for easier navigation, and even translate your website’s content so you can easily build an international brand. 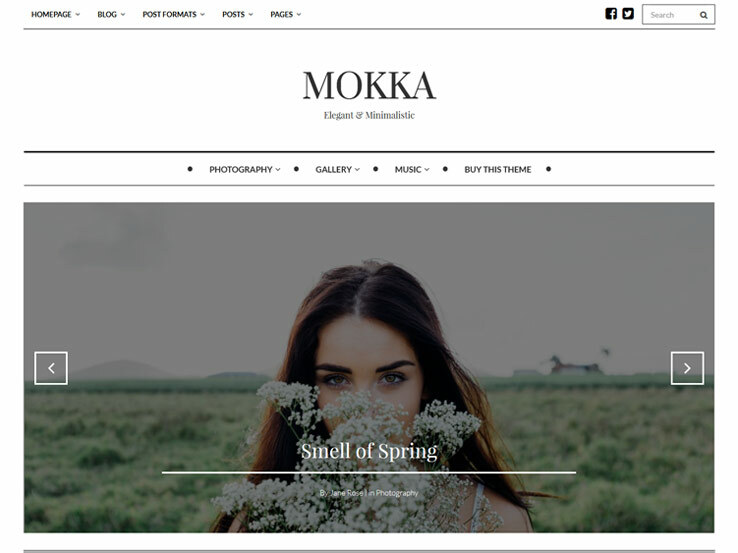 In the end, Mokka offers beauty bloggers a sophisticated feel and plenty of features for encouraging site visitors to get in on the latest beauty trends. Troy embodies the elegant beauty that Helen of Troy was known to possess in the ancient Greek myths that have been passed down for centuries. 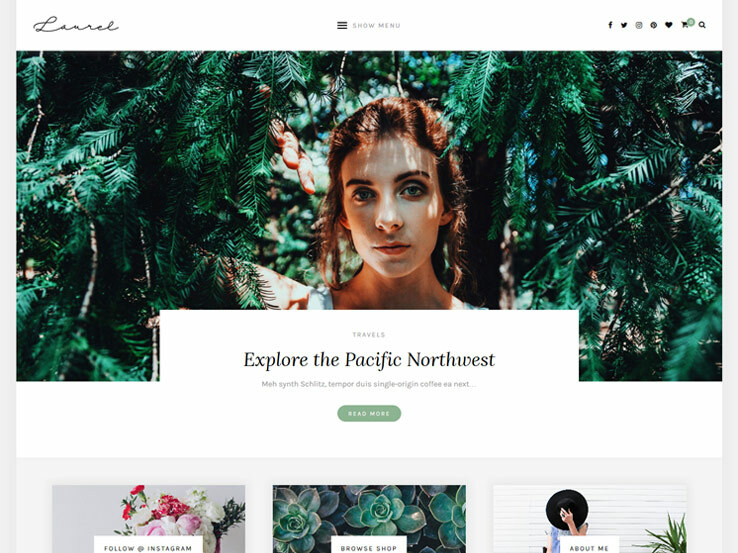 Guaranteeing to promote your content in the best way possible, this beauty WordPress theme features various post formats, custom widgets for added functionality, and carefully selected color schemes to match your best interests. Moreover, it comes SEO optimized, so you know your website will stand out, yet never sacrifices speed and performance. Additionally, Troy plays well with some of the best page builder plugins available today – Elementor, The Divi Builder, and the SiteOrigin Page Builder – so even if you are new to the fashion world, you can get your website up and running in no time. Lastly, integrate your social media icons, subscription box, and Instagram feeds directly into your website’s sidebar for added site activity and brand building. Altogether, Troy offers Helen some fierce competition when it comes to being the most elegant thing known to humankind. 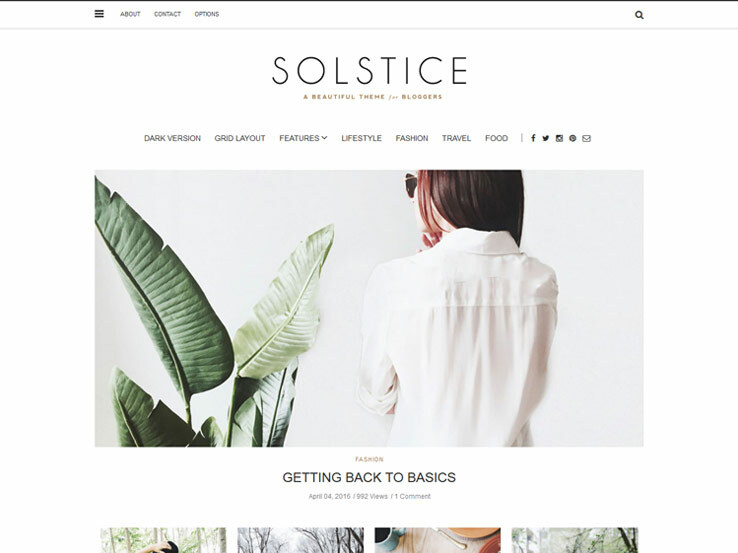 Solstice empowers website owners that are involved in all things beauty. 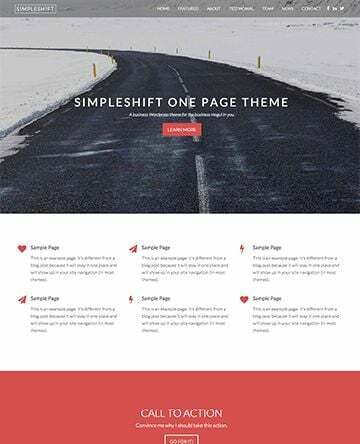 For example, this powerful multipurpose theme starts by providing you the option to customize colors, fonts, and layouts with a few clicks using the intuitive Options Panel. Adding to that, it offers fixed or sticky navigation, list or grid layout options, and a featured posts option so your beauty lovers can get in on the latest fashion crazes. What’s more, Solstice is responsive in design so all of your users on the go can keep up, supports video and gallery posts for added visual appeal, and includes custom social widgets so your readers can share your expertise with everyone they know. In the end, this beauty blog theme is an exceptional option for anyone looking to set the beauty standards straight and keep loyal followers up to date at all times. If you are truly looking to be the first to start a trend, try using Genesis’ first ever feminine parallax beauty blog theme, Simply Charming. 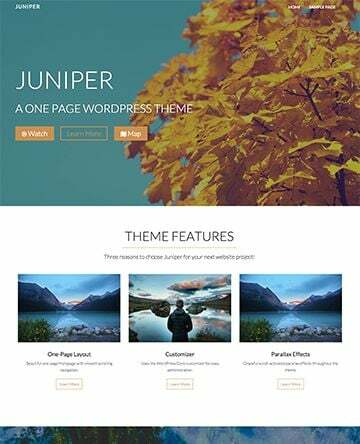 This gorgeous theme offers a delicate and beautiful feel that gets the job done when it comes to overall web design. For instance, you can upload your personal background, include a custom brand logo, and index all of your posts for easy organization. In addition, its responsive nature lets readers access your content from anywhere without having to zoom, scroll, or shake their device. 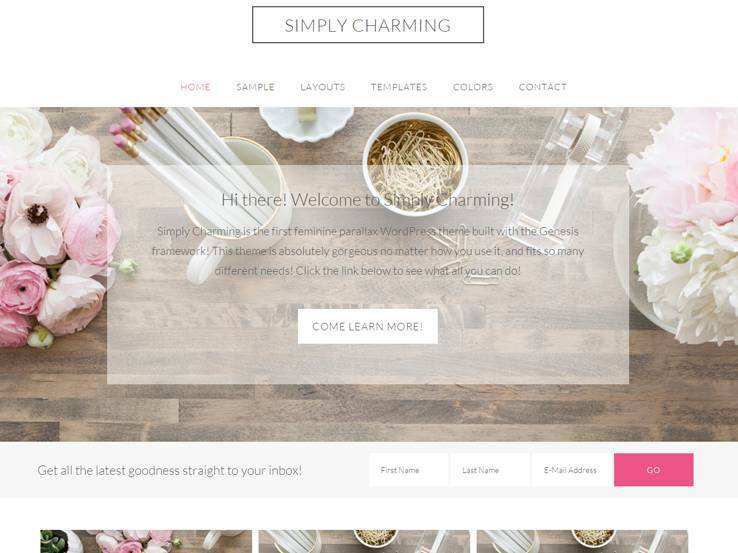 In addition to being a visually appealing beauty theme, complete with smooth parallax effects, Simply Charming is WooCommerce compatible. You can sell all your best beauty products – makeup, perfumes, clothing, and more – straight from your website. And, in order to keep in touch with new and old customers alike, Simply Charming works with the free Genesis eNews Extended plugin for easily adding a subscription form to any Genesis theme. In conclusion, this is just the kind of theme an up-and-coming beauty expert wants for building a successful company. Chic prevents you from creating a standard beauty blog like so many that are found circling the web these days. In fact, Chic’s primary goal is to provide you the needed features for creating a one-of-a-kind beauty blog in the simplest way possible. For example, take advantage of the alternative category style homepage by drag & dropping the elements you want into place. More so, customize your website to be your own using the WordPress customizer. Here you can tweak header styles, choose from hundreds of Google fonts, and peruse unlimited color options using the fun color picker. Need more? 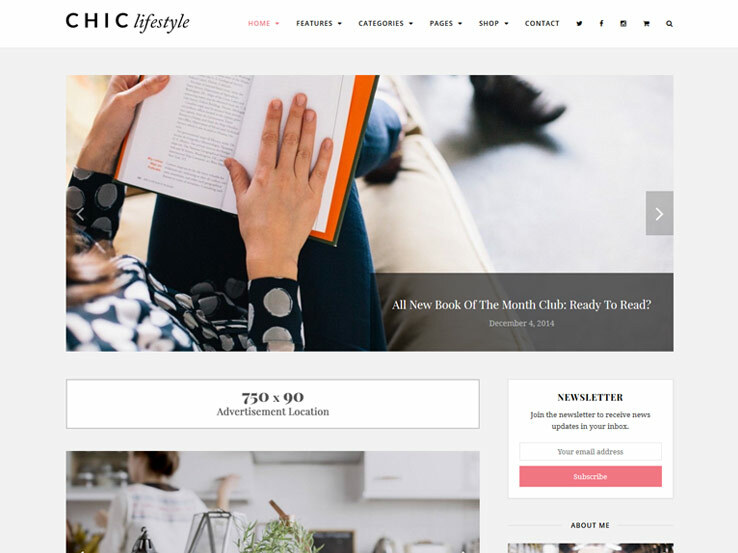 Chic also supports the popular WooCommerce platform for building an online store, gives you access to built-in ad spaces for monetizing your website even more, and offers plenty of column and sidebar options so you can create a website packed full of information or one that is more minimal. In all, this is definitely a theme to consider when it comes to building a beauty blog. This clean, simple, and girly theme, meant for displaying all things beauty related comes to you in a neat little package called The Tawney. 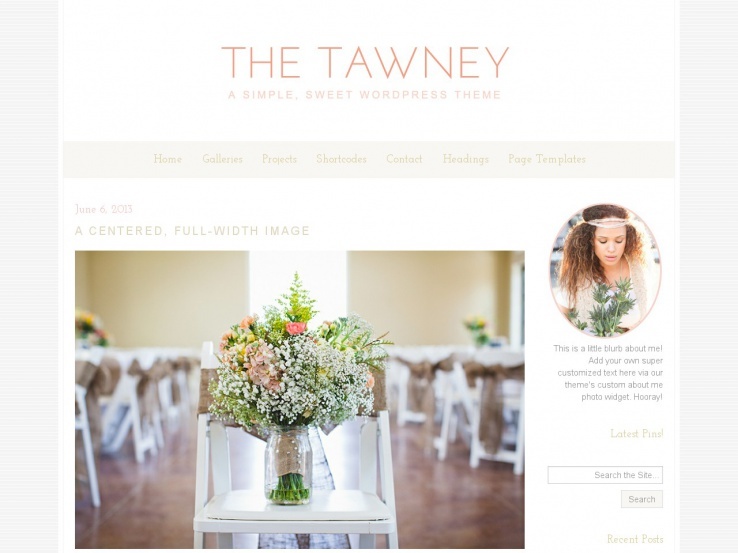 As a fully responsive and cross browser supporting WordPress theme, The Tawney will never disappoint when it comes to rendering for you site visitors – regardless of where they are. Additionally, this intelligent theme allows website owners to place social media icons directly into the header and includes custom widgets for adding more social media elements, an About Me section, and even an image for outbound linking. The Tawney is also great when it comes to its little extras. For example, upload a blog signature image for brand recognition, add a favicon, track your user activity using Google Analytics, and impress site visitors with a mosaic gallery. In the end, it’s The Tawney’s extra effort that solidifies this theme as one of the best beauty blog options around. 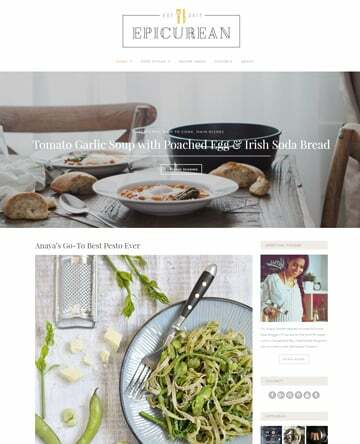 Laurel is one of those WordPress themes that just looks polished no matter how it is designed. With adjustable featured image widths and an eye-catching sidebar display, your site visitors are sure to be drawn into what you have to offer them. In addition, you can organize your posts in a simple grid layout so readers can easily find what they are looking for. Moreover, Laurel offers vibrant slider options, complete with promo boxes directly underneath for added information. Plus, there are plenty of custom widgets for adding things like Instagram feeds of your best beauty inspirations. Lastly, integrate the MailChimp for WordPress plugin to display a newsletter widget so you can stay in touch with loyal followers, reach out to new ones, and get everyone in on special deals you are offering in your conveniently set up WooCommerce shop. 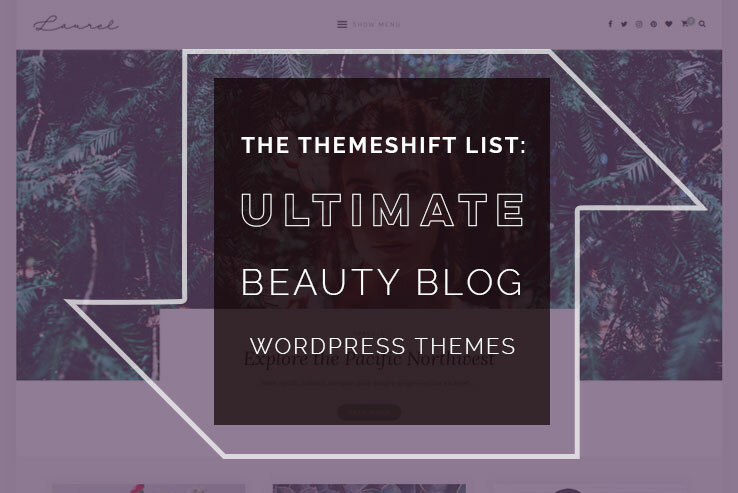 In the end, this theme comes packed with specific features meant for even the most serious of beauty bloggers. 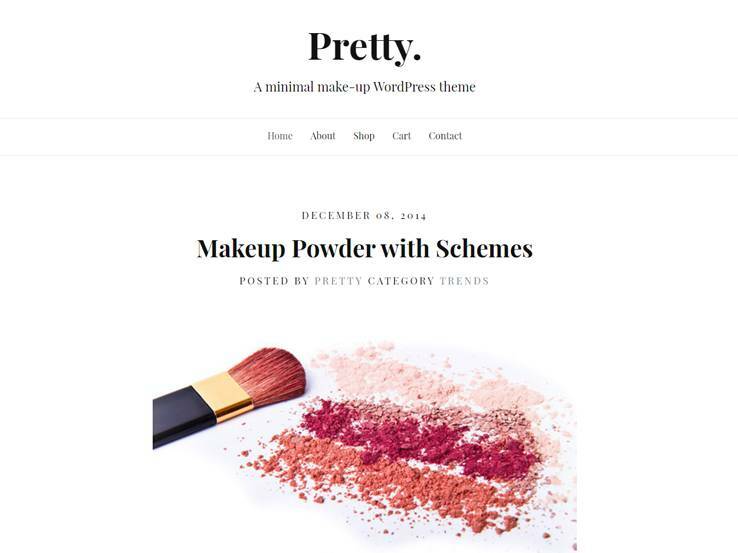 Pretty was developed as a trendy solution for creative beauty bloggers looking to make a statement about all things fashion. Minimal in style, yet completely professional, this classy theme looks great on all devices. In addition, it has exquisite typography and unique animation effects that are sure to make your website stand out amongst all of your competitors. Furthermore, Pretty presents a number of additional special effects such as smooth parallax, hover animations, and 3 creative header styles – normal, side slide, and fullscreen. Built with online shops in mind, this beauty theme also works well with WooCommerce and comes with a filterable portfolio section, Awesome Font Icons, and retina ready image display so your customers know exactly what you are selling and are encouraged to buy one of everything. Altogether, Pretty should not be underestimated as just another pretty theme; it is packed with features that will shape your destiny as a successful beauty blogger.